"...readers who click on stories through the Netvibes Top 3 app are reading twice as many pages as other site visitors. As a result, Netvibes is driving increased page views and increased advertising revenue for us--just by using a free app"
Netvibes, the leader in Decision-Making Dashboards for brands, enterprises and agencies, today announced new statistics demonstrating that the Netvibes “Top 3” App is driving increased traffic and advertising revenues for media publishers that have embedded the complimentary app on their websites. The Netvibes Top 3 app has more than doubled the number of pages-read-per-visitor at Journal du Geek and is driving up to 2% of total traffic for media websites Potins.net and Gameblog. In today’s challenging media environment, online publishers increasingly depend on reader clicks to monetize their operations, with more clicks translating into more advertising revenue. At the same time, more visitors are using Internet AdBlockers, limiting the types of advertising that can effectively be used. As a result, many publishers are seeking new methods to drive readership and increase click rates. The Netvibes Top 3 App, which is available at no cost and can be embedded on any website, is an effective tool for driving more page views and increased advertising revenue in a competitive landscape. The Top 3 App, when natively embedded on a publisher’s website, automatically displays the top 3 most-read articles on the site, thereby coaxing readers to explore and click on more articles. All of the web traffic generated through the Top 3 App stays on the publisher’s website, with no outside links. 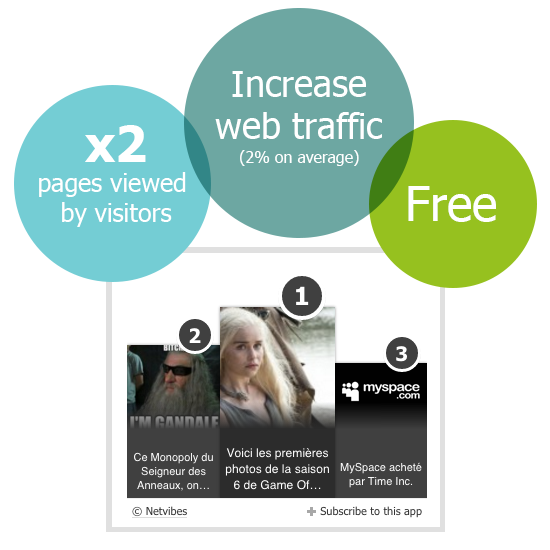 ● Drive increased traffic: The Netvibes app drives up to 2% of total website traffic for media partners. All of the web traffic stays on the publisher’s website. ● Double the pages-read-per-visitor: At Journal du Geek, readers who click on the Top 3 app read twice as many articles per session as other visitors. Netvibes (now part of Dassault Systèmes) is the leading provider of Decision-Making Dashboards for Fortune 500 brands, agencies and enterprises worldwide. For consumers, Netvibes Basic is the most awarded dashboard engine that helps millions of people around the world instantly dashboard everything that matters most, including smart devices in the Internet of Things. For agencies, Netvibes Agency Wizardry creates custom social dashboards in one click to prove social ROI for any campaign, automate reporting, and deliver faster insights to clients. For enterprises, Netvibes for Enterprise connects virtually all internal systems plus the social web together on a secure, real-time dashboard intelligence portal to drive faster decisions, based on data.